Honolulu LASIK surgeon, Dr. Alan Faulkner set out to create an informative and easily accessible resource for his current and potential laser eye surgery and ophthalmology patients in Hawaii. In collaboration with our team of graphic designers and writers at Rosemont Media, both Dr. Faulkner and Dr. Janel Soto have created an innovative website to match the practice’s dedication to bringing their patients the latest in eye care technology. 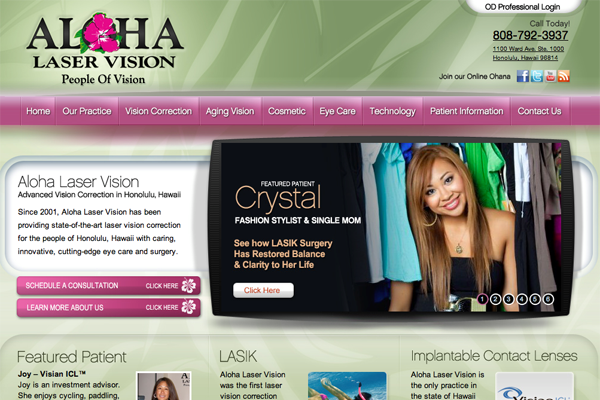 While providing detailed descriptions or all procedures performed, as well as doctor biographies and patient videos, the website also encourages the formation of a social media community for patients to rely on as they consider laser vision correction in Honolulu.